Why I love my PLN | Catalogue This! I meant to post this last week, but I was distracted by assignments. Ah well. I started establishing my Personal Learning Network (PLN) via Twitter about a year ago, at LibraryCamp Perth, in 2010. 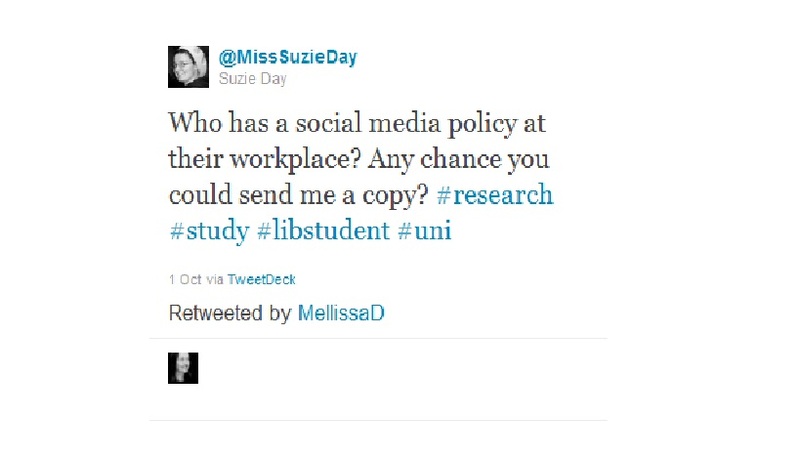 The week before, I had done an assignment at uni that required me to use Twitter for a week (thank you @libsmatter!!!). I had intended to close my account after that, but seeing the way they used Twitter at LibraryCamp (particularly having the LiveStream projected behind the presenter), convinced me of how useful Twitter can be. As a result, that day I began to connect with other librarians, beginning my PLN. Since then, I have built it up. At the time of writing, I have 158 followers, and I am following 78 people (note that I have a personal account, which I use for non-library related Tweeps). So why do I love my PLN? This is why. Last week I was struggling to get started on a particularly nasty uni assignment for Management of Records and Archives Services, where I had to write a policy document on the use of social media within a fictitious organisation. While the assignment is directly related to the unit, we had not done anything that covered the content (that is, policy writing, or social media within the workplace). Because of this, I really had no idea where to start. A quick search showed that the only information publicly available were policy documents that had maybe a paragraph concerning social media, rather than any documents specifically dedicated to the subject. So what did I do? I asked my PLN!!! Within minutes @kalgrl and @kat_frame had Tweeted my links to their workplace policy documents, and someone else advised me they would email theirs, after they had removed their company name from the text. @flexnib was also providing support. As I understand, all three documents that were sent to me were internal policy statements, which are not generally available to the public. All three documents assisted me greatly, in understanding the type of information I would need to include in the assignment. From there, I was able to go away and outline my draft. About an hour later, I was working on a section which I wanted to reference a presentation I had seen at NLS5 a few weeks prior. After searching the digital satchel we were given, and checking with the organisers (via Twitter of course) that mine was not an error, I was able to confirm that the papers written from NLS5 were not yet available from ALIA. So what did I do? Tweet the author, @mpfl, who was able to direct me to the institutional repository it had already been uploaded to. All this within minutes.